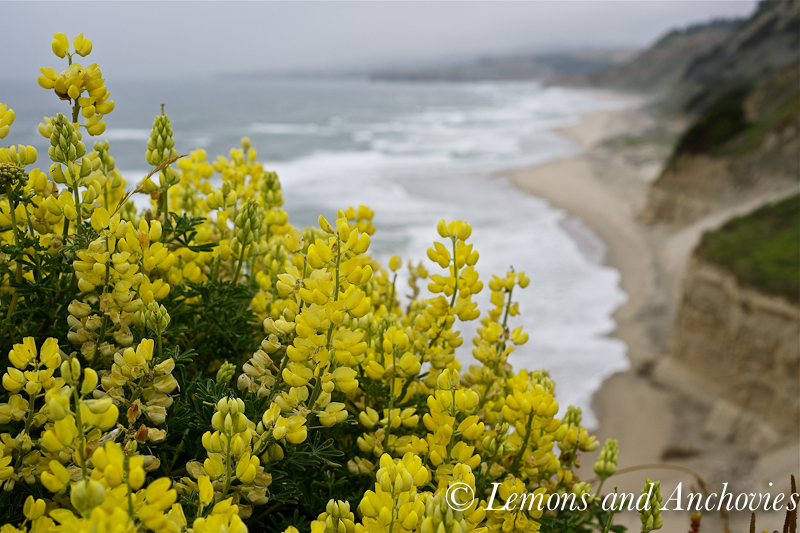 Depending on which direction you’re driving on Highway 1, California’s scenic coastal route, you might avert your gaze from the magnificent vistas long enough to see the sign for Pescadero on your way to Santa Cruz (southbound) or San Francisco (northbound). But it’s more likely that you would miss the sign that reads “Historic Pescadero, established 1856, 2 miles”. 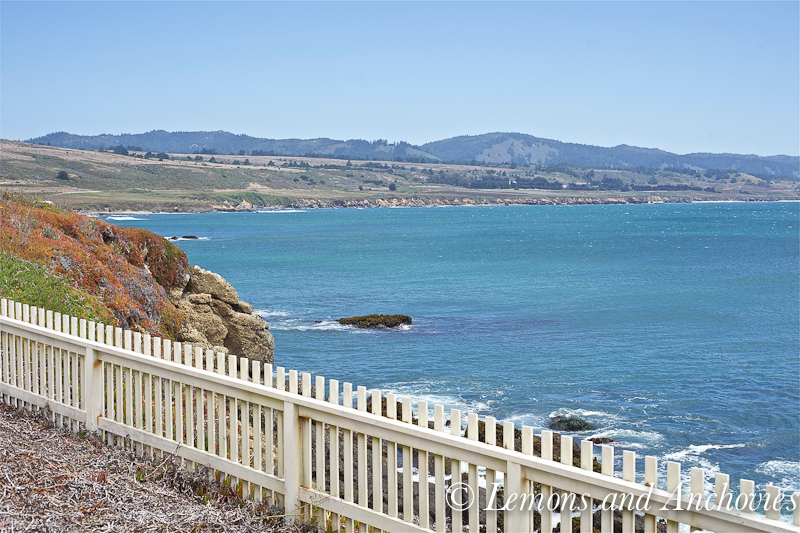 You will not find the high-end shops or decamillion-dollar homes decorating 17-Mile Drive in Carmel but Pescadero is now also a weekend destination in its own right…that is for those who know about it. In its heyday in the late 19th century the town’s fertile soil attracted a lot of settlers and it thrived as a farming and lumber community. Today, Pescadero’s main road is still lined with row after row of artichokes, brussels sprouts, peas, rosemary and flowers but its early prosperity is harder to spot. 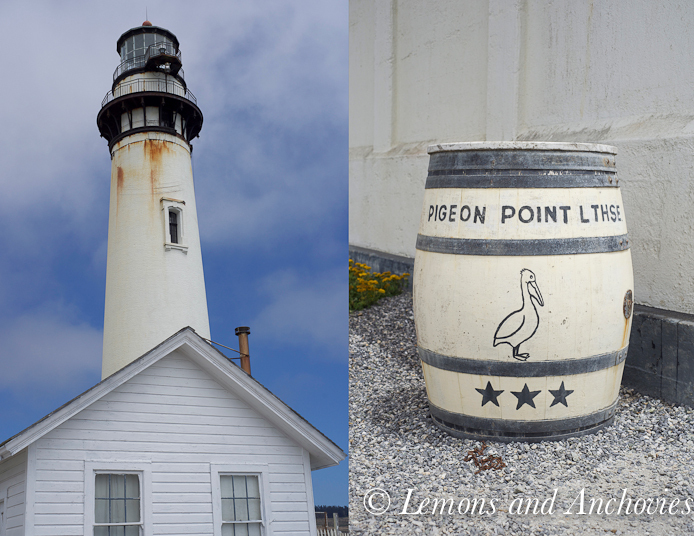 Pescadero’s charm is in its humble small town feel; it’s almost like stepping back in time. 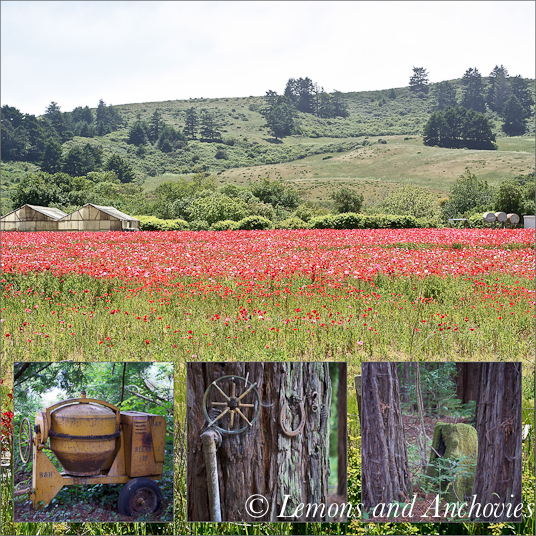 The locals all know each other and many families have lived in Pescadero for generations. 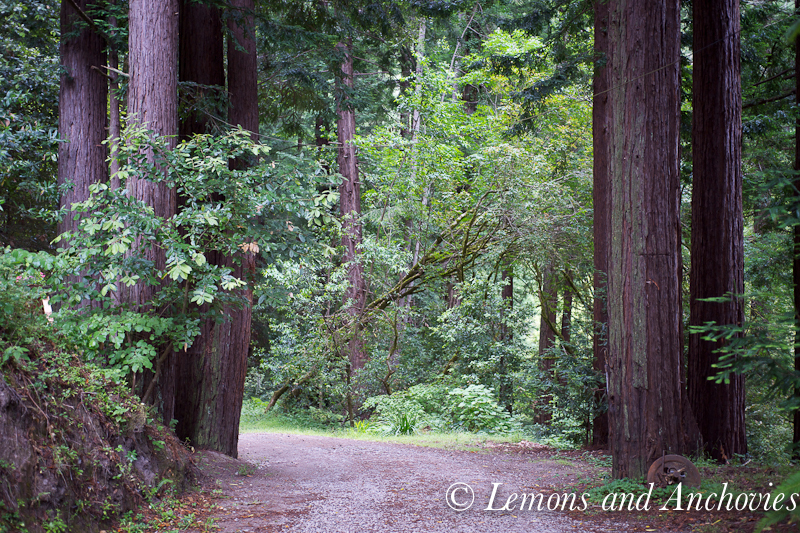 Nestled between the Pacific Ocean and rolling hills studded with redwood trees, Stage Road is the town’s “main” street. While the historic road extends to neighboring San Gregorio, only a very small stretch of it is considered downtown, and this is where weekend tourists center their visit. Before getting there, however, there is a worthy stop or two along the way. 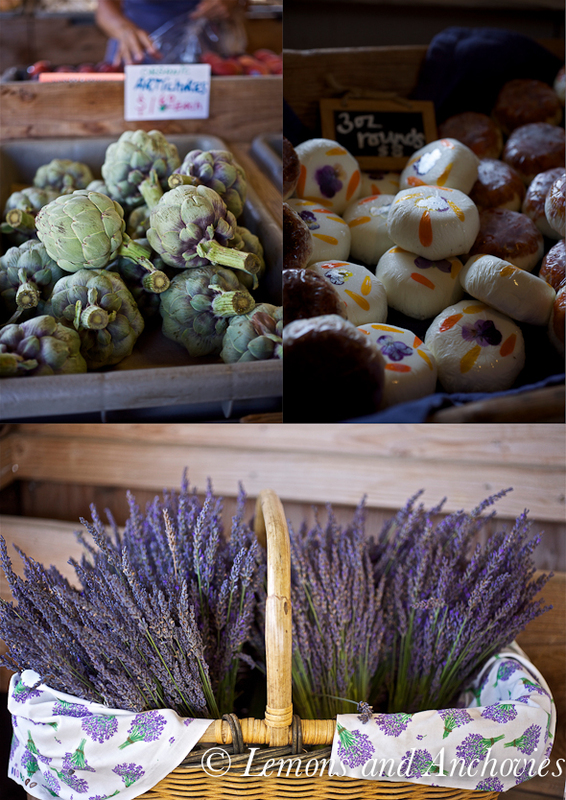 There is no shortage of farm stands here, each one specializing in local crops. Phipp’s Ranch on the other hand, has a little bit of everything. What started as a barnyard in 1978 is now a nursery, a farm animal attraction popular with young families and most notably a country store that boasts an expansive heirloom bean room, herb and spice room, specialty teas and local produce. 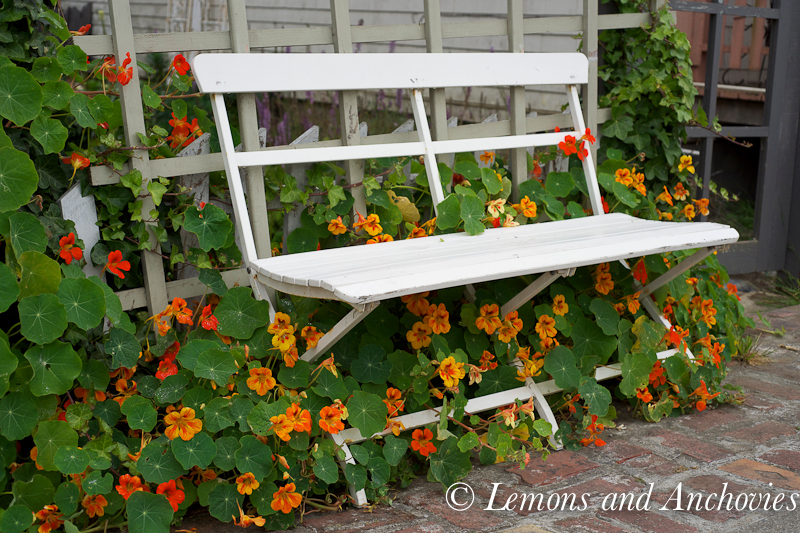 Don’t expect a fancy place–not even shabby chic; rustic and country are the words to keep in mind but if you appreciate shopping for quality local products, you will not be disappointed. Past Phipp’s Ranch and approaching Stage Road you will see the alpine goats on North Street belonging to Harley Farms. The dairy farm is well-known by cheese fans for their award-winning chevre, fromage blanc, ricotta and feta cheese. Each time I step inside the shop I’m tempted to linger for hours, not just to sample all the cheeses on display but also to fill my basket with infused olive oil, farm fresh eggs, gardening tools and cheese boards. There is so much to share about this local gem that it deserves its very own Local Spotlight feature (coming soon). Finally, you reach Stage Road. On one corner is the two-pump gas station that may not be worth noting unless you’re running low on fuel but inside is a mercado and Taqueria de Amigos, home to some of the best burritos I’ve enjoyed over the last 12 years. Lines can get long during the week at lunch hour with local workers but service is fast and efficient. Enjoy the fragrance of sizzling meat wafting from the grill behind the counter. The complete Mexican menu is sure to have your meat of choice for enchiladas or tacos but I always come for the carnitas burrito (and free chips and salsa). My drink of choice is either horchata or freshly-made carrot juice; I order my meal to go and unwrap my foil-packed lunch in front of the state beach two miles away. Across the taqueria is Duarte’s, perhaps Pescadero’s most recognizable establishment. Founded in 1894, the tavern has been a part of most of Pescadero’s history. The fourth generation of the Duarte family is in charge now, keeping the tasty traditions that Frank and Emma Duarte started at the end of the 19th century. My first taste at Duarte’s was of their Cream of Green Chile soup; I’ve tried to recreate it at home unsuccessfully and I suspect that it’s because I need Duarte blood running through my veins in order to get it right. Artichokes are big on the menu and be prepared to wait in line on weekends. Worth noting for foodies: the James Beard Foundation awarded Duarte’s an honorary award as an American classic in 2003, one of only five restaurants in the United States to receive the distinction. 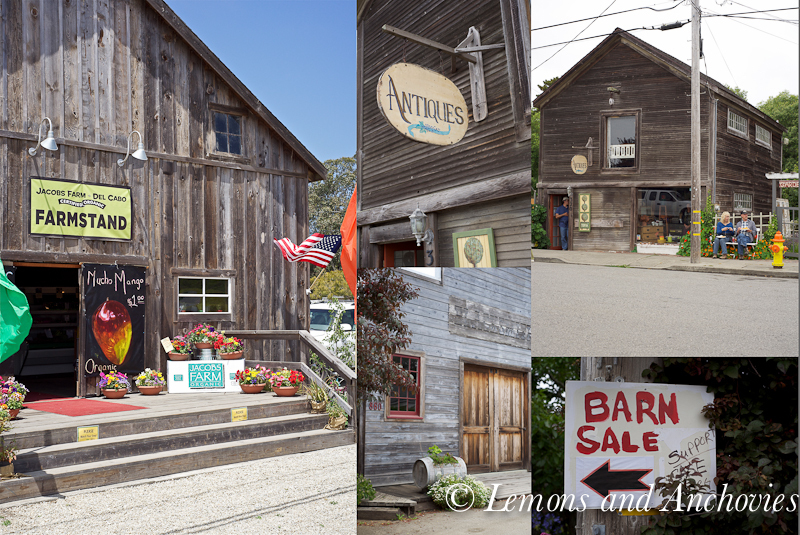 As you walk along “Main Street” you might notice locals and visitors alike congregating in two main spots: Norm’s Market and Pescadero Country Store. It would not be uncommon to see pickup trucks lined up during the week in front of the stores and countless bicycles leaning against the buildings. Pescadero is a popular stop for Bay Area bicyclists (and motorcyclists) on weekends when time permits for the longer coast ride. My husband and I consider our Pescadero loop one of our favorite bicycle rides, a moderate 56-mile round trip route that allows us to leave the city environs behind even for just a few hours. 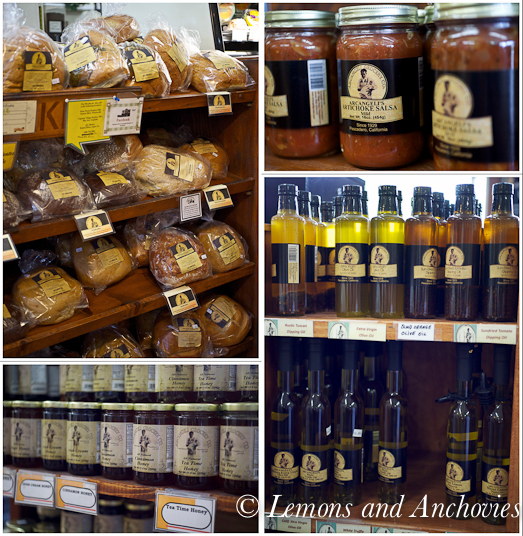 Both Norm’s and the Country Store are an ideal stop for groceries or a meal on the go but each has something different to offer. Norm’s Market’s official name is Arcangeli Grocery. Considered one of the oldest family-owned businesses in California, it was founded in 1929 by Norm Benedetti’s grandfather and is now run by Mr. Benedetti and his son, Mike. 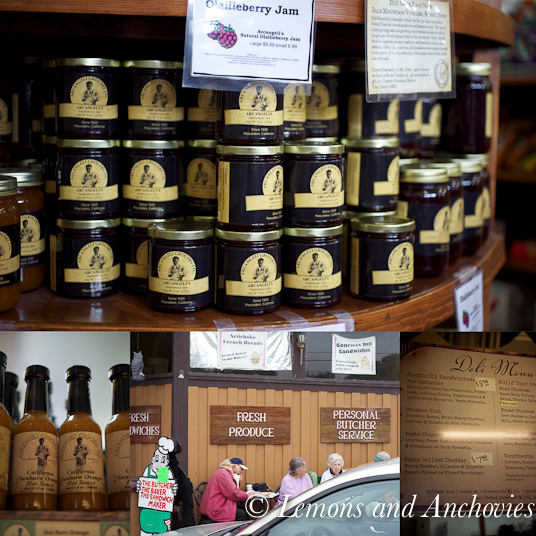 What started out as a neighborhood grocery and bakery is now one of the landmarks of Pescadero. Breads from Arcangeli Bakery are served at the full-service deli behind the store. I consider it a red letter day when I can get there in time to order a chicken salad sandwich on their Garlic Herb Sourdough. The chicken salad sandwich tastes like my mom prepared it for me when I was a child and well, there’s nothing like their breads. Beyond the sandwiches (and the other draw for me) is shelf after shelf of specialty items that one would have difficulty finding anywhere else (unless you order online). There are breads (Garlic Herb Sourdough, Cranberry Walnut Sourdough, Cheese Cheddar Artichoke, Pesto Artichoke, Cinnamon Swirl Bread, just to name a few), homemade pork sausages (linguica,chorizo, artichoke, etc), infused olive oils, jams, salsas, pasta sauces, marinades, honey , cookies, pastries and so much more. And the wine? 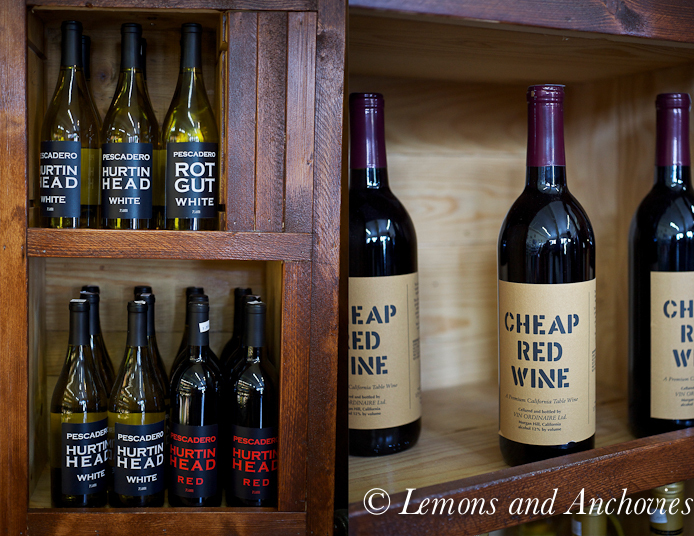 I couldn’t help but share images of their “Hurtin Head” and “Cheap” wines displayed near the cashier’s station but don’t let this fool you. One wall is covered with California wines along with vintage Cabernets and French Bordeaux that are housed in the Arcangeli wine cellar. You might pop inside Norm’s to pick up a sandwich but you will likely walk out with much more. 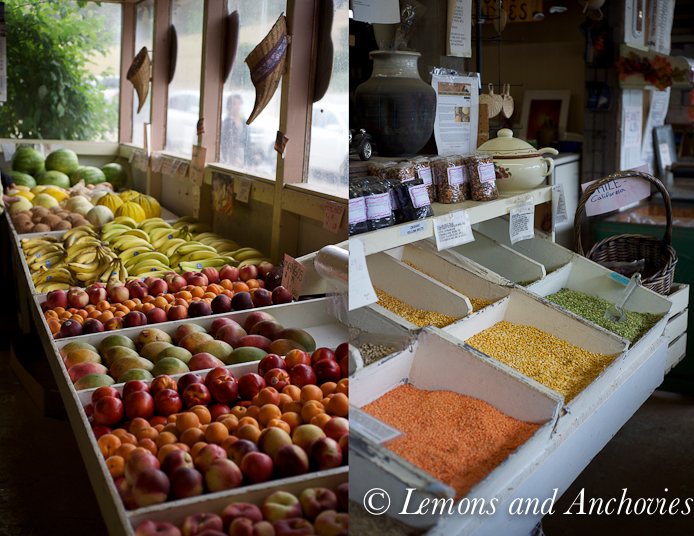 Next door to Norm’s is Pescadero Country Store. A market/deli when I first visited the store a dozen years ago, the owner, Cindy, has turned her place of business into something more. The deli at the back of the store can get quite busy, too, as she offers freshly made sandwiches, salads and a different soup each day. In recent years, Cindy has expanded the store to cater better to the tourists and cyclists. A brick oven commands attention as you enter but you remember the gourmet pizzas it produces when you exit. The dining area is spacious and a bar serves libations if you want something more than Diet Coke or Snapple Tea from the refrigerated section at the back of the store. On summer weekends Cindy’s place is even busier as she offers live music and barbecue at the picnic area adjacent to her store. 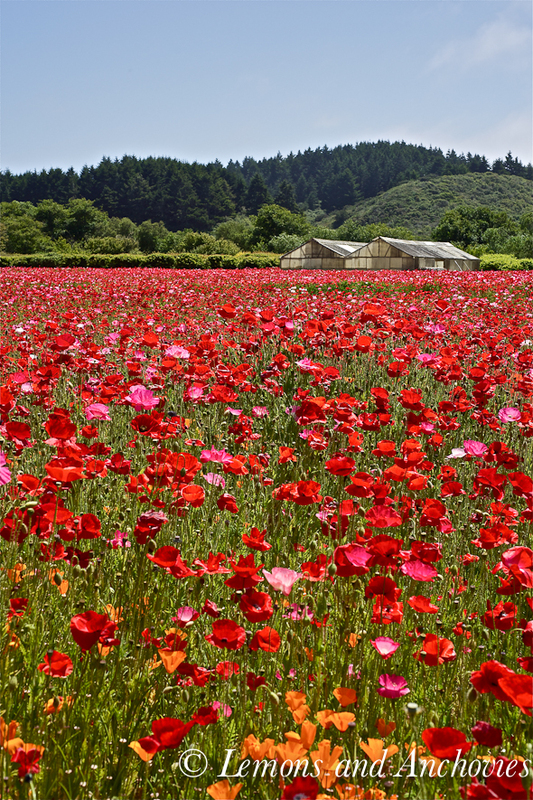 Perhaps beyond Pescadero’s rich history and small-town charm, its other big draw is its proximity to the Pacific Ocean. If you like the idea of watching seagulls, seals and pelicans, if you can listen to the waves crashing for hours on end or if you want to simply park your car at the state beach and watch the boats go by as you eat your carnitas burrito or chicken salad sandwich, Pescadero would be hard to beat. I raise my hand to all of the above. Pescadero is so close to San Francisco, the city where I grew up, but it offers something quite unique. Don’t take my word for it, though. See for yourself the next time you visit this part of the California coast. 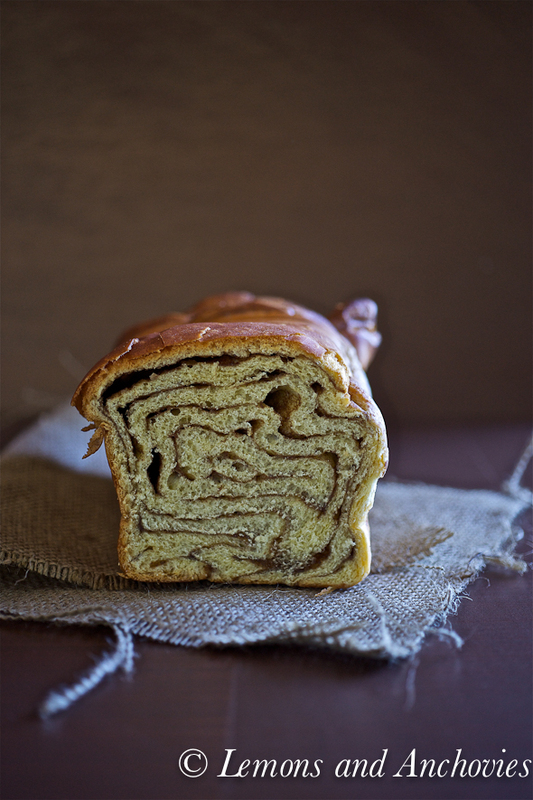 During one of my recent visits to Pescadero, I picked up a loaf of Arcangeli Bakery’s Cinnamon Swirl bread. Soft and with just the right amount of cinnamon flavor, I enjoy it toasted and often eat it with a slice of cheddar cheese. I found, however, that its texture is ideal for French toast as the bread soaks up the batter beautifully. I upped the cinnamon flavor by sprinkling more into the batter. Soft and moist inside and crisp on the outside, these were wonderful with the traditional accompaniments of maple syrup and powdered sugar. Don’t forget the fresh fruit on the side. 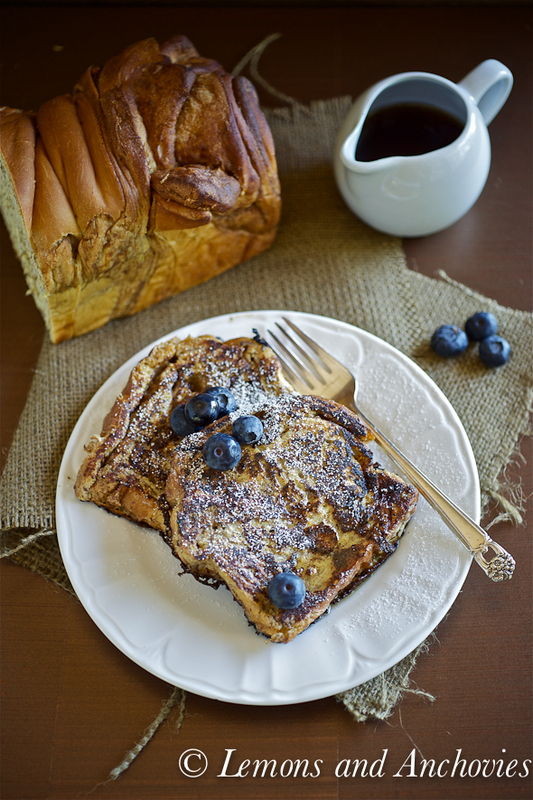 Locally-made Cinnamon Swirl Bread give classic French toast an extra pop of cinnamon flavor. Slice the bread in roughly ¾-inch thick slices and set aside. Prepare the batter by whisking together in a platter the eggs, half and half (or milk), vanilla extract, cinnamon and sugar. Heat one tablespoon of butter in a pan over medium heat. Dip one slice of bread at a time into the batter on both sides, allowing the bread to soak up the liquid. Once the pan is hot and the butter melted, cook the bread until golden on both sides, about 1 minute for each side. Add butter to the pan as needed, for each batch of bread being cooked. 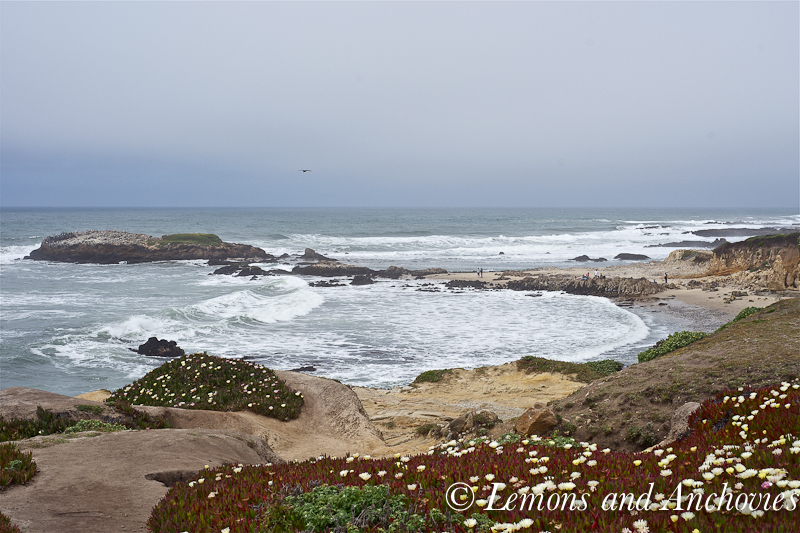 Lovely photos of Pescadero – I haven’t been there recently and clearly it’s time to take a drive over! As for the French toast, I love that you used cinnamon-swirl bread. That’s my favorite way to enjoy it! I love this new series, Jean! And I must visit Pescadero with the family, your recommendations in hand – it would be a perfect little excursion, so close! I can’t believe I have never been. 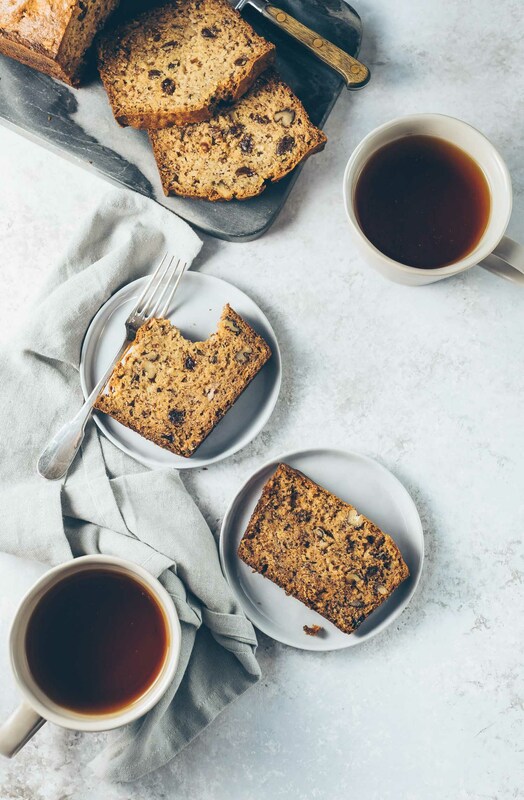 The french toast looks so good, I wish I could have some right now as I enjoy my afternoon coffee! Oh, Jean!! What a gem of a spot you have found!! Yes, I’m one of those people who had driven past that location numerous times and has never stopped. While I’m not in the area very often anymore, I’m keeping this secret tucked away for my next visit. Liv would adore that french toast!!! Jean – I LOVE THIS SERIES! Keep these posts coming!!! Hubby and I need to venture over there for a weekend. We headed to Healdsburg this weekend and it was wonderful. 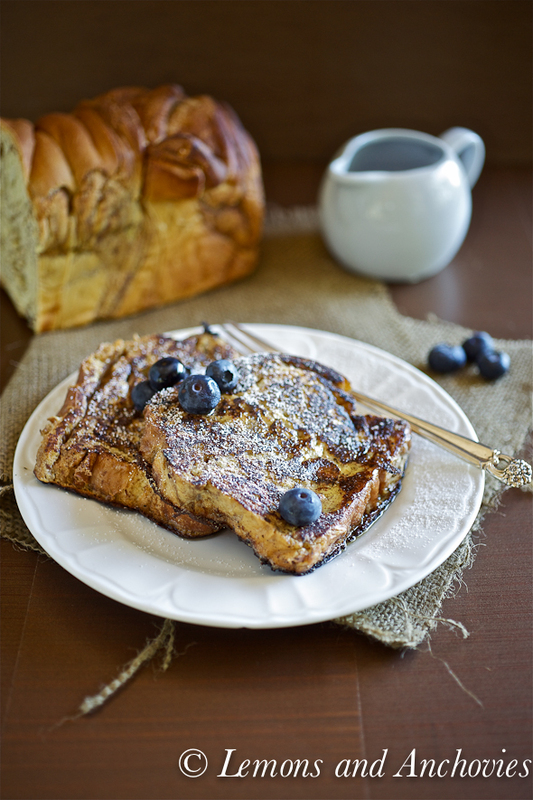 That cinnamon bread looks simply divine and loving using it for french toast – I bet is was supreme!!!! I so enjoyed reading this beautiful post, Jean! Your photos are gorgeous!!! …and now I am longing for french toast! 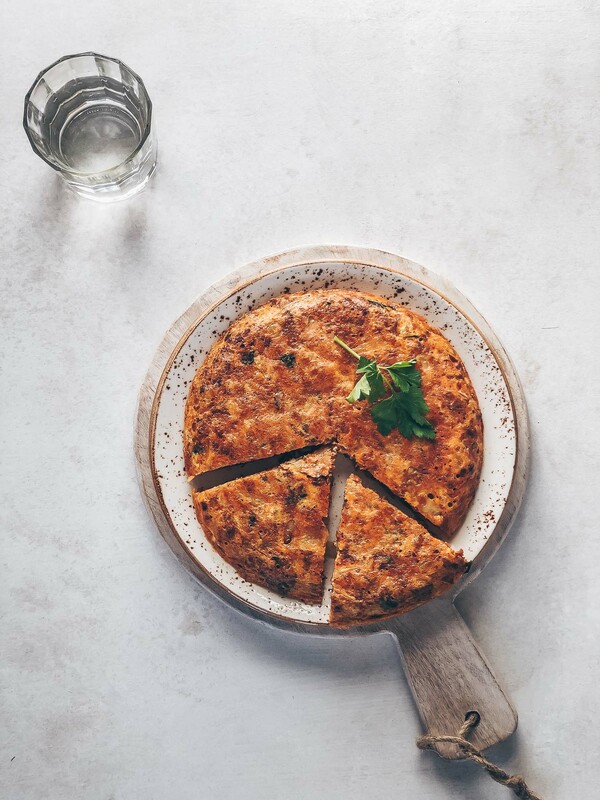 What a lovely post with such great photos of Pascadero. I lived in SLO for a short while and got to drive up and thru that area on the way to San Fran and it’s just all so beautiful. 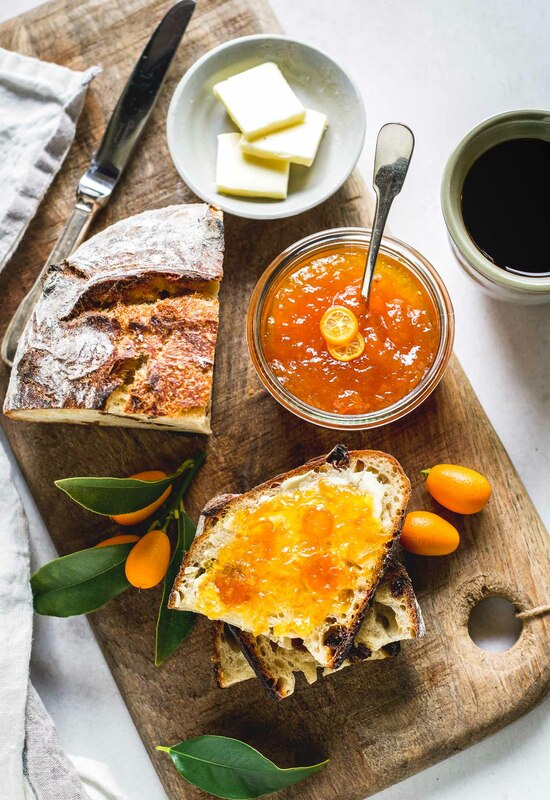 I adore french toast and especially with some amazing bread. Thanks for the recommendations and tour through the quaint town. OMG! Need to visit — this will be my next day trip when I’m bored. Now, who do I con into going with me so we can order more than one dish at each meal stop? So happy when a blogger lives in the same neighborhood. I can totally take advantage of your reviews. That cinnamon swirl bread looks SUPER delicious. Love the side shot of this bread. I need to hunt down…. 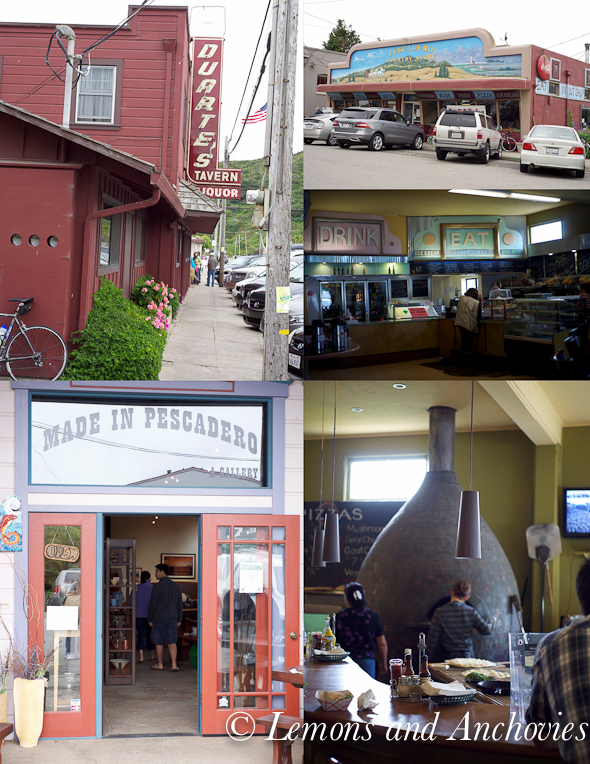 I’ve been to Pescadero before but don’t remember stopping by any of the stores. I look forward to your series! What a delicious french toast. I need two loaves – one for this and one for tasting it by itself. What great pictures. I like this new feature you have, will be fun to see your area of the country! Stunning photos. What a great idea for a series. I felt like I was by your side for the day travelling along with you. When I grow up I want to travel as much as you do. Wow, Pescadero is pretty! You are so fortunate to live near such a wonderful place! 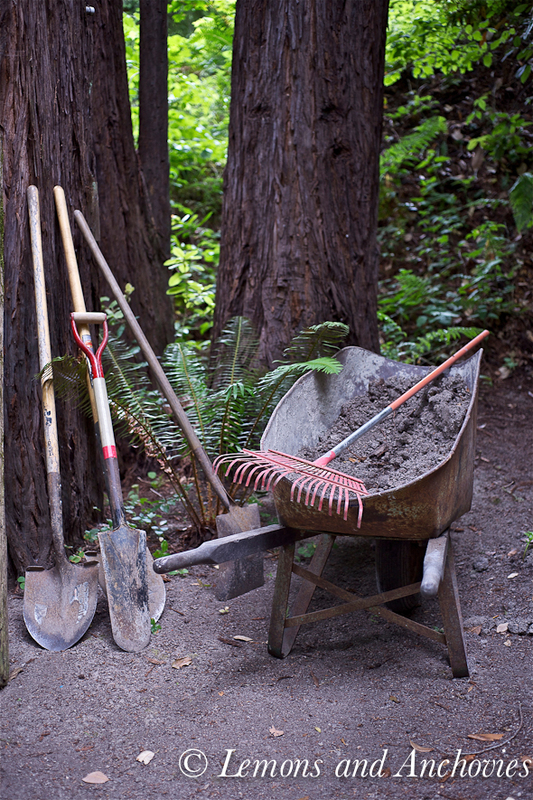 I totally believe the Californian soil is so rich and potent. I have an aunt in Alameda who just throws seeds in her backyard and they actually sprout and grow! Wow, that’s unheard of in Toronto! Hi Jean, Thanks for the little tour! I loved it. I felt like I was on a mini-vacay. 🙂 Cinnamon french toast is a favorite of ours too. That and Hawaiian bread french toast. Love your blog and this article. My girlfriend and I are now planning a photo day trip for October! 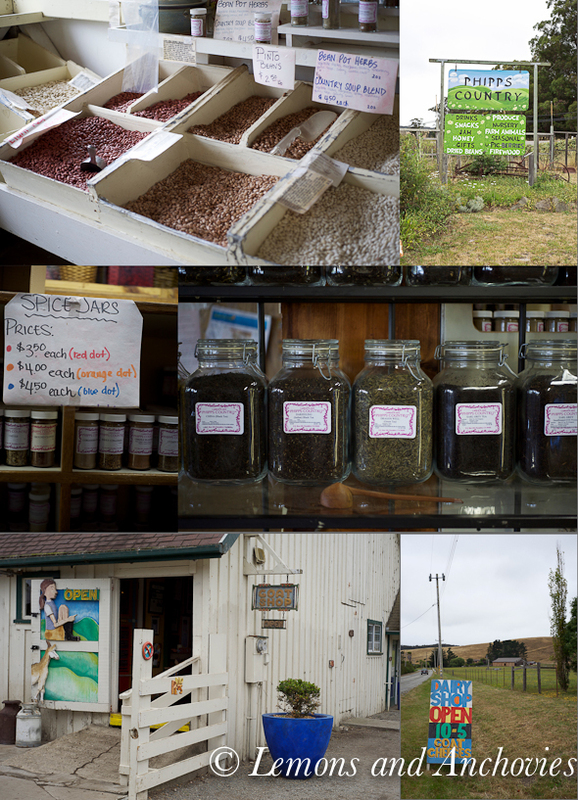 I love Pescadero and love taking out of town visitors to Duarte’s. Next time you go, order the Half & Half soup. It’s not on the menu but it’s a bowl of half Cream of Green Chili soup and half Cream of Artichoke soup. Best of both worlds as I can’t pick a favorite of the two! !